Guus is a Dutch Business Economics student who focuses on financial matters. 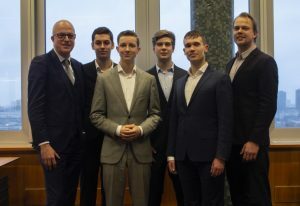 He didn’t fall in love with his area of study as much as he thought he would, until he discovered the international business case competitions. Guus works best under pressure and tries at all times to think outside the box. He comes from a family where everybody works in hospitals, so he considers himself as the ‘black sheep’, although he experiences the same pleasure when helping other people. When he is not studying, he loves to spend time with his friends who share the same love for football. Guus considers himself as a “top chef”, although this isn’t always confirmed by his female roommates. Wesley is a 4thyear Bachelor of Commerce student with a major in Marketing and a passion for innovation. He was born and raised in rural Strijen, The Netherlands. Wesley has helped 1styear students in his role as a peer coach and student lecturer. He has completed marketing and in-house management consulting internships and has worked as an online marketeer. Wesley has recently done a program that specializes on Strategy, Management and Consulting. He represented the Rotterdam Business School at JMUCC 2018. Wesley is currently writing his thesis on the organizational embedding of innovation capabilities in a Dutch SME. Daniel is a Dutch and American citizen who studies International Business and Management while doing a premaster for Strategic Entrepreneurship. For him, school leaves room for more challenges; the current one being setting up his first official business. This is also what he plans on doing in the future: working for companies is fun but starting for yourself is the real deal. Some of his separate interests are: public speaking, spending time with friends and family, and doing over the top romantic things for his girlfriend. Nathan is a 4thyear International Business major student who likes to connect with people from different cultures and disciplines to gain new perspectives and spark creativity. His interest lies in creating effectiveness within the team. Furthermore, he brings to the table his analytical skills to come to a sensible case solution. On weekends, he spends his time as a trainer on the soccer field. In the future, he wants to grow as a leader and help people to develop their talents. Daan is a principal lecturer (MA, MSc, BEng) in the Industrial Management & Engineering program of Rotterdam University of Applied Sciences, where he specializes in Strategy and Change Management. He also coordinates the university’s International Management & Consultancy minor program. As part of the latter program, Daan runs a research project in which students prepare client organizations for their future business environment using scenario-based strategy formation methodology. Ron has a propaedeutic degree in Physics and graduated with honours in Political Science, specializing in Public Administration. After his studies he started a distinguished career, mostly within the discipline of higher education. He has worked at the Ministry of Education, Culture and Science as Deputy Director of Higher Education and as Chief Executive of Student Finance. Currently, he is President of Rotterdam University of Applied Sciences. He has also held important supervisory positions with regard to the accreditation of higher education, and he was member of the Committee on the Future Sustainability of the Dutch Higher Education System. Throughout his career he has also taught, most recently a class on Strategic Development at Rotterdam University of Applied Sciences.